Take a guided Segway tour through Atlanta's historic neighborhoods such as Downtown, Cabbagetown, Old Fourth Ward and Inman Park. Stop at landmarks like the Martin Luther King Jr. National Historic Park, Oakland Cemetery, and admire innovative developments such as the Atlanta Beltline. 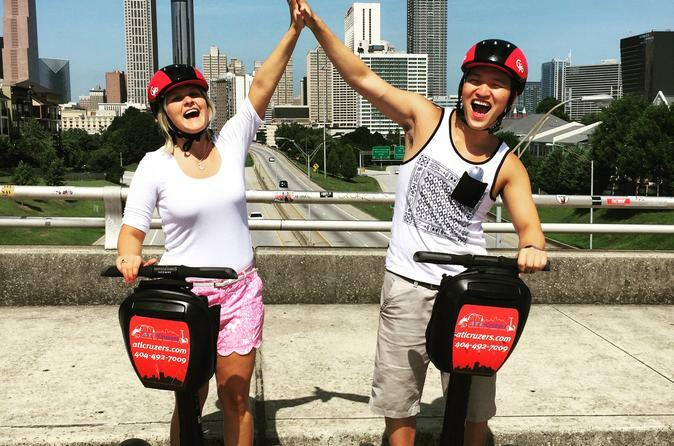 Traveling by Segway allows you to cover more ground than walking and stay close to the action for an unforgettable sightseeing tour of Atlanta. Once you meet your guide in downtown Atlanta, start your tour by receiving 15–30 minutes of Segway training. When your group feels comfortable, hop on your two-wheel transport and set out to see Atlanta! You’ll have plenty of opportunities to stop for photos and to ask questions of your friendly and knowledgeable guide along the way. Glide through Downtown Atlanta, pass the over the iconic Jackson Street bridge, then hop over to the Old Fourth Ward and the Martin Luther King Jr. National Historic Park, which commemorates the famous civil rights leader. Pass the red brick walls of the venerable Ebenezer Baptist Church, where Dr. King, his father, and grandfather all served as ministers. In the 1960s, the church evolved into a spiritual haven for civil rights activists. You'll visit Inman Park, once the site of legendary Civil War battles. Marvel at the grand old homes — the area was also part of the first-planned Atlanta suburb in the late 19th century — as you snap photos and experience a glimpse of the Atlanta Beltline, a former 22-mile (35-km) railroad corridor that is being redeveloped into a network of public parks and multi-use trails. It’s yet another example of the treasures to be found in this dynamic city! to the Cabbagetown neighborhood and hear about its transformation from small mill town to an artist haven with terrific restaurants. Keep an eye out for colorful street murals as you go. Continue to the historic Oakland Cemetery, the final resting place of many of Atlanta’s most notable citizens, and take in its architectural flourishes and peaceful gardens. During your journey around Atlanta’s neighborhoods and quieter streets, you’ll gain an understanding of the city’s past and present while learning fun facts from your experienced guide. After 2.5 hours, return to the starting point to end your tour.